The COMMUNIA Final Report (as approved by the EU Commission) is finally available online. 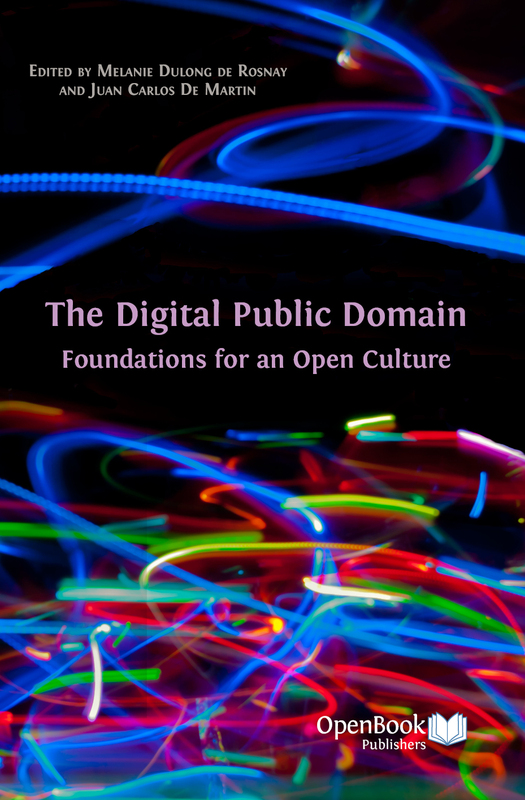 This Report provides a useful insight on the activities of COMMUNIA, while also addressing the state of the digital public domain in Europe and providing some policy recommend for enhancing public domain and making digital content more accessible and re-usable by all citizens. Please read it, share it and spread the word! Publication of the COMMUNIA book "The Digital Public Domain: Foundations for an Open Culture"
The book "The Digital Public Domain: Foundations for an Open Culture", edited by Melanie Dulong de Rosnay and Juan Carlos De Martin as an output of the Communia Thematic Network, is out in all formats (hardback, paperback, and digital editions) and can be purchased on the website of OpenBookPublishers. After almost four years of activities, the COMMUNIA Project is closing down. But many members, willing to pursue its overall goals, decided to form of an International Non-Profit Association based in Brussels. The Association’s mission is to educate about, advocate for, offer expertise and research about the public domain in the digital age within society and with policy-makers. The COMMUNIA Association aims at expanding the discussion and activities carried out by the Project so far, planning in particular to help us create a more balanced discussion about copyright in the digital environment and maximize the economic, social and cultural impact of our cultural and scientific heritage. The COMMUNIA Association launch event is planned for Thursday June 16, 2011 at 09:00PM CEST, at The MONK Café Rue Sainte Catherine, 42, in Bruxelles. Everybody is welcome! More details on its website and on this LinkedIn page. Here is a first article/interview about the new Association, while a list of 14 principles to protect and promote the public domain has already been drafted. It includes a warning against ever-longer automatic copyright protection periods (up to 90 years), a call to sanction “any false or misleading attempt to misappropriate public domain material,” and to only grant full copyright protection to registered works. Please spread the word, join us in Bruxelles and follow this new endeavour on Twitter! Yale University announced a new "Open Access" policy that gives free access to online images of millions of objects housed in Yale's museums, archives, and libraries. More than 250,000 images are already available through a newly-developed a collective catalog. The final goal is to make high quality digital images of Yale's vast cultural heritage collections in the public domain openly and freely available. As works in these collections become digitized, the museums and libraries will make those images that are in the public domain freely accessible. Only the collections of the Peabody Museum of Natural History encompass over 12 million specimens and objects in 11 curatorial divisions, from anthropology to vertebrate zoology, while the University holds world-renowned art collections from antiquity to the present and is also home to the world's seventh largest library system, with over 10 million volumes and countless manuscripts and documents in 18 libraries. "With this pioneering open access policy, Yale reminds us that with any great academic collection comes a great responsibility: to share our cultural heritage openly in order to advance scholarship not only on campus but around the world," noted Max Marmor, president of the Samuel H. Kress Foundation, which encourages teaching, learning and scholarship in the history of art. From May 13th, with PORTO, the scientific papers produced by the academic community of the Politecnico di Torino will begin to be freely accessible online. At this time, the knowledge produced by universities, almost always with public funds, is accessible only by bearing the cost of subscriptions to scientific magazines. With the creation of PORTO, the Politecnico will make available an infrastructure of great value not only for the scientific community, but as a true common good, which will benefit everyone, from individuals and productive system that will easily appreciate the academic research and its results. The NEXA Center for Internet & Society has been glad to contribute to this important initiative of the Politecnico. The Opéra de Lyon has launched an innovative music competition, entirely managed online and based on public domain content. "Mozart, C'est Vous!" includes 16 original compositions covering various genres (from jazz to folk to classics) played by French artists and bands. People can browse and watch each video online, and then enter their preference directly on the web, from April 5th through the 11th. The votes of the online competition will be combined with the decision of the two-professional jury. The final winners will play in July under the Peristyle during the Opéra de Lyon summer concerts. Given that EU public bodies produce thousands upon thousands of datasets every year -- from how our tax money is spent to the quality of the air we breathe -- this new project is an open call to designers, developers, journalists, researchers and others to people to come up with something useful, valuable or interesting for European citizens built solely using open data. Anyone can suggest an idea, submit working applications or visual representations or datasets originally assembled - in the respective four challenging areas. There is currently a total of €20,000 in prizes plus several awards to be won. The competition is open from 5th April until 5th June midnight. The winners will be selected by an all star cast of open data gurus (including EC Vice President Neelie Kroes and Sir Tim Berners-Lee) and announced in mid June at the European Digital Assembly in Brussels. The Open Data Challenge is being coordinated by the Open Knowledge Foundation and the Open Forum Academy under the auspices of the Share PSI initiative, with many EU academic centers and institutional agencies in the supporting role. Owni.eu, an innovative project of digital journalism, covering technology, politics and culture in French and English, published an interesting piece about the history of the Internet. Actually, it is an interactive timeline (app) comprising manifestos, declarations and other public documents, drafted by various experts and organizations from 1981 to 2011 -- including also the Public Domain Manifesto. Can public domain works be "restored" into copyright? The US Supreme Court will says it will hear a case considering whether public domain works can be "re-copyrighted." And advocacy groups say that free speech is at stake in this fight. Congress' decision to uphold an international treaty allowing for public works to be "restored" into copyright will create an atmosphere of uncertainty for libraries, they warn, caretakers of the public domain. "Because it protects our cultural commons, the public domain is equally essential, in turn, to free speech, helping to give meaning to the First Amendment right to receive information," wrote the Electronic Frontier Foundation and Internet Archive in a brief asking the Supremes to hear the matter. "Given the large number of works in the collections of US libraries, libraries must reasonably fear that they could be sued multiple times if they continued to provide access to the materials in their collections that might be withdrawn from the public domain." The case, scheduled for next fall, is Golan v. Holder (formerly Golan v. Gonzales). Lawrence Golan is a symphony conductor who availed himself of some manuscripts of the composer Sergei Prokofiev—that is until they reverted back into copyright, thanks to Congress's upholding Section 514 of the Uruguay Round Agreements Act. The International Music Score Library Project, a Web site founded five years ago by a conservatory student, then 19 years old, has made a vast expanse of musical treasures available for free. This public domain repertory of classical music includes Beethoven piano sonatas, Schubert songs, Mozart symphonies, and much more: by simply following the example of Google Books and Project Gutenberg it has grown to be one of the largest sources of scores anywhere. As reported by the New York Times, the IMSLP website is an open-source repository that uses the Wikipedia template and philosophy, “a visual analogue of a normal library,” in the words of its founder, Edward W. Guo, the former conservatory student. Volunteers scan in scores or import them from other sources, like Beethoven House, the museum and research institute in Bonn, Germany. Other users oversee copyright issues and perform maintenance. Quality control — like catching missed pages — is also left to the public. “It’s completely crowd sourced,” Mr. Guo said. Despite legal attacks from some music publishers about possible copyright infringements (Universal Edition threatened a cease-and-desist order against the site for copyright violations in October 2007), the site “has the potential to democratize printed classical music much as open source has democratized the programming world," explained the cellist of the Chiara String Quartet. And the same website homepage states: "We at the IMSLP believe that music should be something that is easily accessible for everyone. For this purpose we have created a music library to provide music scores free of charge to anyone with internet access". While many important composers are barely represented or absent because the copyright has not expired for their works, a number of contemporary composers have agreed to allow their works to be scanned under a Creative Commons license. Another evidence of the success about the site's mission: to promote music by making available for free a good slice of humanity’s musical treasures.